The Common Frog (Rana temporaria) is the only species of frog found in Ireland and is listed as an internationally important species. Frogs are protected under the European Union Habitats Directive and by the Irish Wildlife Act. Frogs are amphibians which means they can survive in the water and on land. Their body is well adapted to this dual life. Their large eyes bulge out of the top of their head so the frog can keep a sharp lookout for food and danger. The eyes are very sensitive to movement. When frogs leap they draw eyes their back into their sockets to protect them from damage. Frogs have an ear drum behind the eyes and their hearing is good. Nostils in front of the eyes are used by frogs to breathe when they are on land. A frog’s skin is loose on its body and moist. Under the water they breathe through their skin. Skin colour and markings vary enormously. The basic colour ranges from a pale green-grey through yellow to a dark olive-coloured brown. The only regular markings are the dark bars across the limbs, and streaks behind and in front of the eyes. The colourful patterns on the frog’s skin help to disguise it from enemies such as rats, herons and hedgehogs. A frog can also make its skin become darker to match its surroundings. This colour change takes about two hours. Frogs have four fingers and five toes. The webbed feet are like flippers and help the frog to swim away from danger very fast. The frog’s hind legs are very muscular which helps it to swim in the water and leap on land. Each time the frog croaks, the loose skin on his throat expands. Frogs make lots of different sounds, especially in spring during the breeding season when they return to the wetland in which they were born to breed. Food: Slugs, worms, flies and other insects. The frog’s long sticky tongue is attached to the front part of the mouth, so that it can flick out to catch food. Habitat: Damp vegetation, camouflaged ponds, hedgerows. Reproduction: Breed around February and spawn around March, Tadpoles hatch and grow from April to May, Tadpoles metamorphose into froglets, and leave the pond in June/July. The IPCC Hop to It Frog Data provides information on the timing of the emergence of the different stages in the life cycle of the frog (see chart for details). Frogs like to be near ponds which have plenty of algae and plants near the edge, usually with shallow edges so that they can easily climb out. Frogs use garden ponds, farm ponds, wildlife ponds, streams, bog pools, drains and ditches as breeding sites. The chart shows the various breeding habitats recorded for data from 1997-2017. The terrestrial habitat of frogs is also important. The land around the breeding site or pond needs to be rough with long grass and some scrub to give cover for terrestrial foraging. Frogs also require habitats for hibernation. Large stones, old logs and hedgerows offer just such accommodation. The Common Frog is considered to be widespread and common in Ireland but vulnerable in the rest of Europe. Rana temporaria has an extensive range of habitat – from sea level to nearly as high as the snow line on mountains 760m up. The map opposite shows the IPCC frog data collected from 1997 to 2017 and the distribution map for frogs in Ireland. 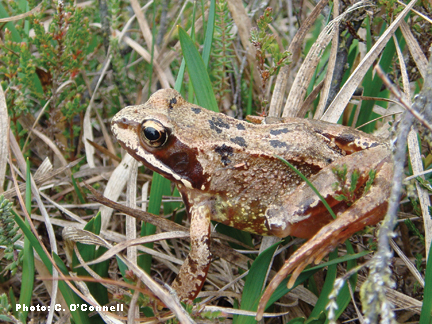 The first ‘Hop To It Frog Survey’ began in 1997 and was co-ordinated by the Irish Peatland Conservation Council. 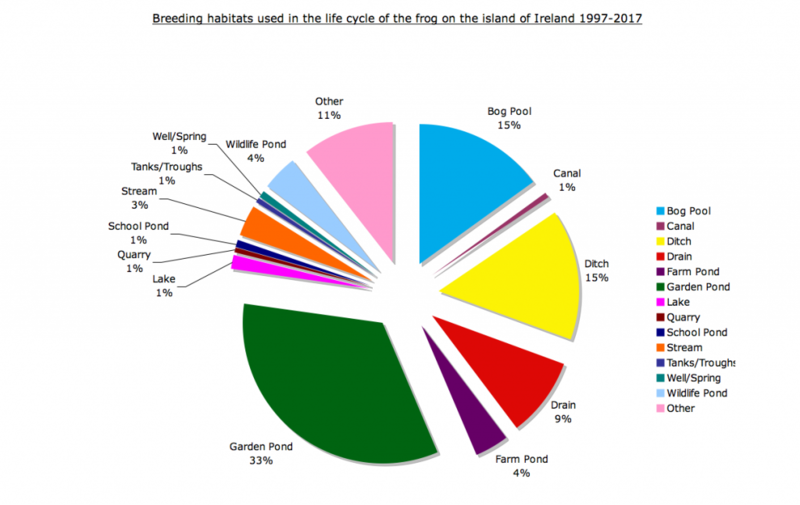 The survey provided base-line information on frogs in Ireland, such as their biogeographical distribution, preferred habitats, breeding habits and success. Prior to this, surveys on the distribution of the frog in Ireland were undertaken by researchers in An Foras Forbartha, the Ulster Museum and Trinity College Dublin. 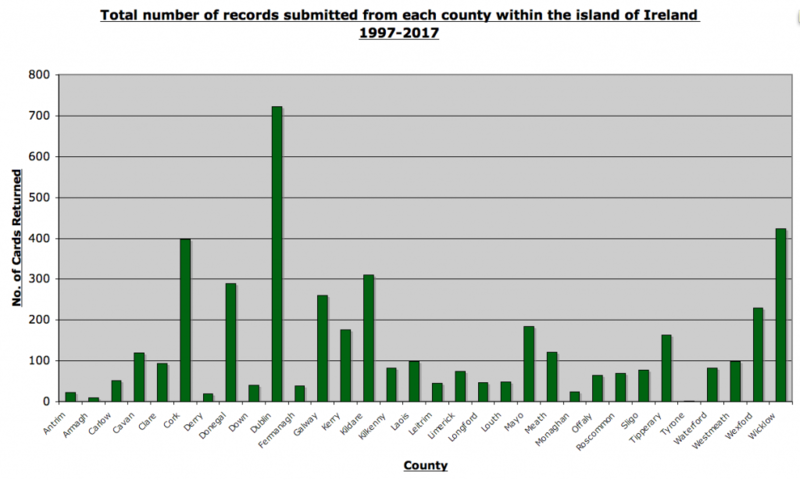 The Hop to It Frog Survey has been going strong since 1997 and by the end of 2017, the IPCC had over 4,500 records from the 32 counties of Ireland (see chart inset). The records show that frogs occur and reproduce in every county in Ireland. The majority of frogs are found from 0 to 450 meters above sea level (in the Wicklow mountains). This includes all five stages in the life cycle. Our records show that frogs occur in the inner city (1%), city suburbs (17%) and the countryside (82%). Garden ponds are the most important habitats for breeding frogs, accounting for nearly 50% of all records received. Other important habitats are bog pools, ditches, drains and puddles. 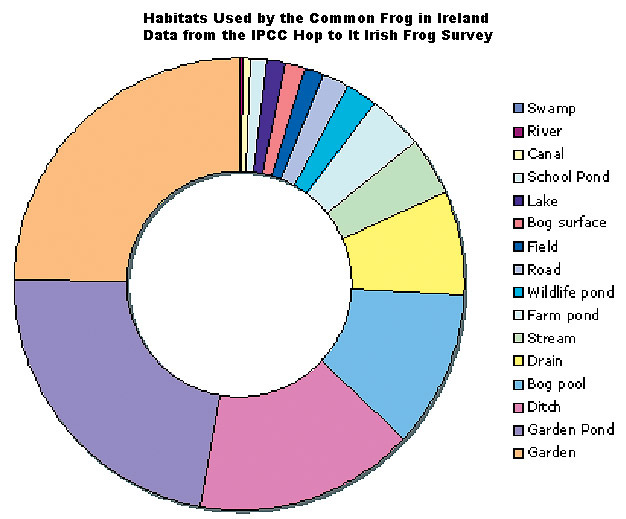 IPCC’s Hop to It Irish Frog Database is proving to be a valuable information source for protecting biodiversity in Ireland. IPCC’s frog information is being fed into County Council Biodiversity Action Plans. 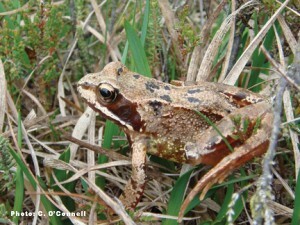 The information was used in the National Parks and Wildlife Service conservation assessment of the Frog in Ireland in 2008 and 2012 and by various researchers. Natural Mortality: Amphibians play an important role in the food chain. During spring and summer many thousands are killed and eaten daily to nourish predators such as otters, foxes or herons. For a typical lump of spawn containing 2,000 eggs, 95% of the eggs may hatch. Only 1-5% of the remaining tadpoles make it through the metamorphosis and only a handful of the original 2,000 reach sexual maturity. If spawn is laid early in the season, hard frost may kill it, especially in shallow water. Tadpoles may also die if their aquatic habitat dries out before they have metamorphosed. Habitat Loss: Over 50% of Ireland’s amphibian wetlands have been lost to drainage, industrial peat extraction, pollution and natural senescence in the past 100 years. The terrestrial habitat of frogs is also important. Unfortunately just as the wetlands are being drained, hedgerows are also being destroyed to make way for industrial farming methods. Fire: An extensive danger to frogs is that of accidental fires. In any hot dry summer there are inevitably going to be accidental fires which can result in the loss of habitat. Another threat for the common frog is from deliberate regular burning of bogland in the belief that this improves the grazing for farm stock. Pollution: Exposure to chemical fertilisers, pesticides and herbicides can cause frogs agonising deaths. Ammonium nitrate granules can kill a frog within 5 minutes. It is thought that the chemicals are absorbed into the skin and affect the balance of chemicals in the moist tissue. They then suffer a massive toxic attack. Water polluted with heavy metals such as Aluminium, Cadmium, Zinc, Copper and Iron are toxic to frogs. Lead from car exhausts may be important even in rural areas. Acid rain can also increase the toxicity of metals in ponds causing further threats to frog populations. UV Radiation: UV radiation has become a prime candidate for blame in the world-wide decline in frog numbers in recent years. In 1989 herpetologists from around the world reported declines in amphibian numbers. UV radiation damages DNA causing cell mutations and death. Frogs have very low levels of the necessary enzyme, photlayse, to repair the damage, and it is believed that this is a large contributor to their apparent demise. Fatal Infections: The fungus Batrachochytrium dendrobatidis paratises amphibians and has caused frog and toad population declines throughout the world since the 1980’s. The fungus destroys the skin pigment keratin in amphibians. Frogs infected appear emaciated and lethargic, often with abnormalities of the skin or eyes. The fungus has caused the extinction of the Costa Rican golden toad (Bufo periglenes) and serious frog kills in Panama, Australia and the U. S. The rapid spread of the fungus at 42km per year, has been blamed on ozone depletion and loss of forest cover, which change the habitats of sensitive amphibians. Several mass deaths of frogs have been blamed on a disease known as “red leg”. A British study has uncovered a new virus – Ranavirus which is responsible for killing frogs by the hundred. Road Migration Deaths: During a few warm, damp nights in spring, thousands of amphibians follow traditional migration routes on their way to spawning ponds. Unfortunately, hundreds can be squashed and killed by traffic on intervening roads as they make for a suitable pond. Food and Pets: Europe imports hundreds of millions of frogs from Indonesia, India and Bangladesh, threatening some species. Millions of South African frogs have been exported to the U.S. as pets. The American bull frog, a pet in Britain is a danger to native frogs. Once these or others escape they displace natural amphibian populations by hunting them or mating and producing hybrids. The release of exotic species into the wild is an offense under the Wildlife Act. 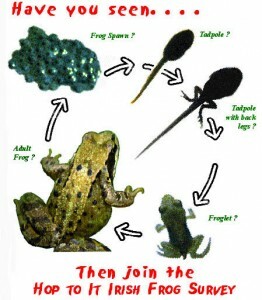 What can you do to Help Irish Frogs ? Make a garden pond to encourage frogs to breed. Frogs spend most of their lives on land so give them long grass, leaf and log piles, trees and shrubs in your garden to feed and hibernate under. Pass on your knowledge of frogs to others. Do not keep endangered frog species as pets and never release a pet frog into the wild. Organise a clean up of rubbish from local ponds and streams. 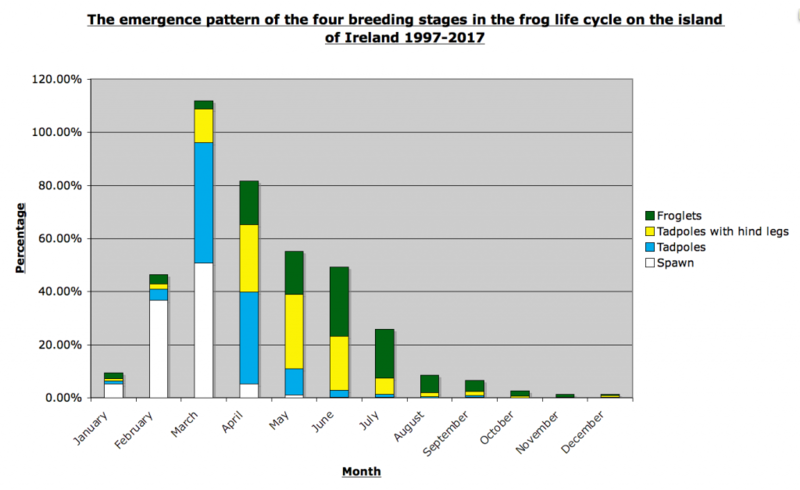 Take part in the Hop To It Irish Frog Survey and help us learn more about the status of frogs in Ireland. You can fill in a survey form on line from here. There are three species of amphibian found in Ireland – the Natterjack Toad (Epidalea calamita), the Smooth Newt (Triturus vulgaris) and the Common Frog (Rana temporaria). The Natterjack toad is extremely rare, and is confined to a few areas in Counties Kerry and Wexford. 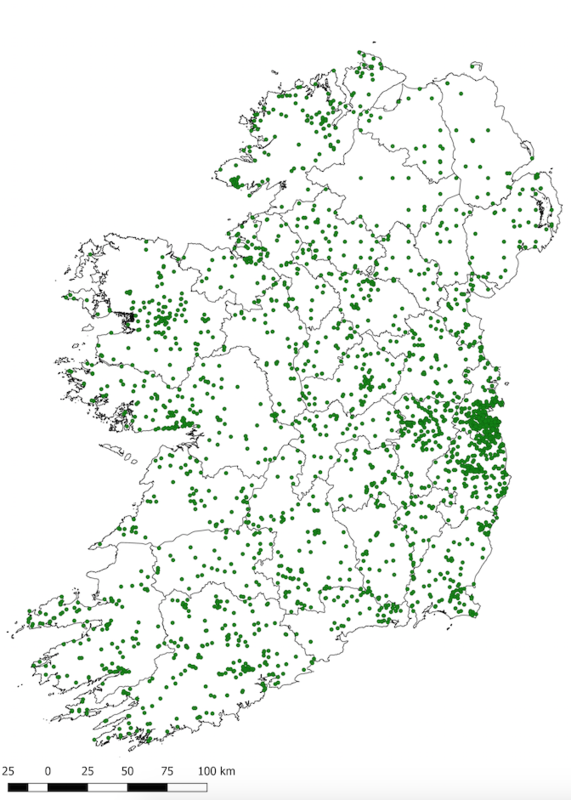 The smooth Newt is fairly widespread in Ireland, although it may be very local in distribution in the north-west and south-west.